If you asked me what my favorite season is, I would have to say fall. The cool, crisp air feels so refreshing. When the chill has become a bit much, you can get cozy inside and indulge in comforting, rich scents. I enjoy scents a number of ways, one of which is with soothing skincare. I used to be so sensitive to certain skincare items I would have to use "unscented" versions... not much fun. The key is to find quality ingredients that are suitable for your skin type and then, you can indulge! Farmhouse Fresh products are a beautiful balance of natural and organic ingredients that still feel lush and luxurious with their formulas and fragrances. They have soothed and hydrated my skin while still allowing me to enjoy their decadent scents. The two items I have been using lately are their all new Marshmallow Melt hand cream and Plum Chiffon all-purpose balm. Whether at home or on-the-go, these products can keep your skin baby-bottom smooth without worry of a messy pump or fragile container you'd be hesitant to throw in your bag. The hand cream features a metal squeeze tube to insure you get to enjoy every drop of product. It is a great size to throw in your purse and would also be safe to take on a plane. If you have a hard time finishing large bottles of lotion, this size is perfect. The rich cream is really soothing and doesn't take a lot to get the job done. The scent is sweet and indulgent but has a hint of freshness. For areas that are particularly stubborn (heels, I'm looking at you), Farmhouse Fresh makes a luxurious all-purpose-balm. This balm contains cocoa and mango butter (my personal favorite!) for ultimate hydration. It is solid and melts with the touch of your fingers for easy application. 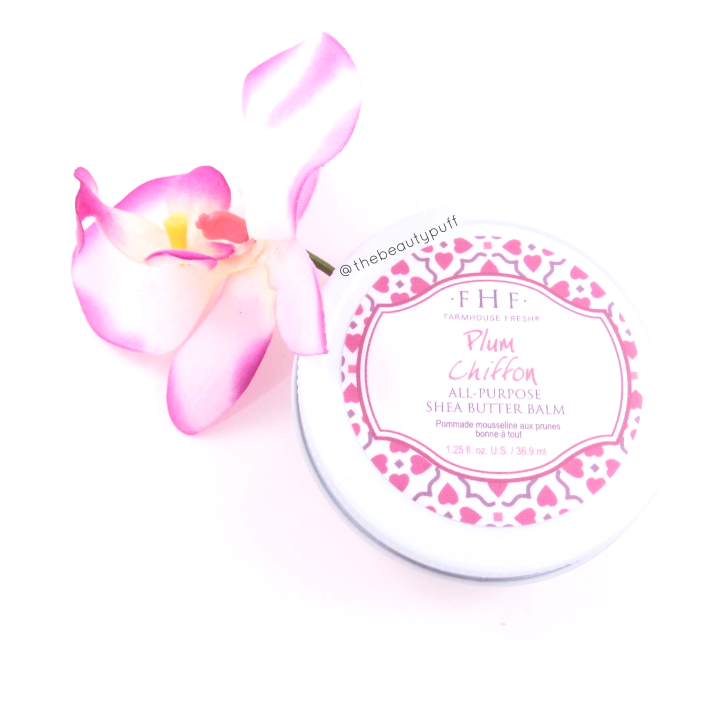 I notice instant relief of my dry skin on contact with this balm, which works with just a thin layer. For a thicker, more concentrated application, it can be applied on your heels followed by a soft pair of socks for the ultimate spa experience. I love doing this in the cooler months while I get things done around the house - afterall, I love multi-tasking! The Plum Chiffon smell is a beautiful balance of sweetness and freshness. It is described as a sugared plum rose. The plum scent gives it a sophistication, not typical of many "fruity" scents I've come across. It smells delicious! Whether on their own, or side by side, these two products would make beautiful gifts for this time of year. Not only are the scents universally appealing, but you can feel confident about the ingredients in these products because they are paraben and sulfate free. If you are looking for products that are vegan, the hand creams are perfect. The all-purpose balms are not vegan as they contain beeswax. Farmhouse Fresh products are 90-99% natural and 99% are vegan or gluten free. For more information on their ingredients and what goes into their products, click here.